An arrangement worthy of your uptown girl, this one rocks! Modern without being trendy. Gorgeous without being girly. If your woman knows style, this is the gift for her. 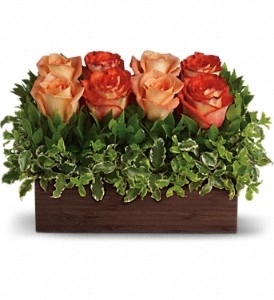 Outrageously beautiful dark orange and peach roses are nestled in a garden of greens and delivered in a unique bamboo rectangle.